Video review for "Hands-on Application Development with ASP.NET Core and Angular"
This video from Packt explains step by step how to build a sample application in Angular and ASP.NET Core. The video is targeted to developers who have some working knowledge of development in this workspace. As the titles hint, the sample application is an 'orders' app. The user is guided through the construction from tools setup to testing. Each section is further divided into segments (usually 3 of them), each about 5 minutes long. I found this an excellent setup, as each video is long enough to provide the necessary content but not so long that my attention started to wander. Raihan Taher (the instructor) spoke clearly and at a reasonable pace. One small complaint: viewing the series in a browser, I didn't find any speed controls to speed up or slow down the presentation. I really like learning by video, but I like it best when I can control the pace. The entire video shows the instructor's desktop, with accompanying instructions "now we do this, then this, then this..." so the user gets to see every step along the way as the sample application is built. There is little in the way of 'overview' material, so the viewer is given practically no high-level information about Angular or ASP.NET. The result: You may not understand why you are doing something, but you are given instructions on how to do it successfully, at least in one situation. Watching this video is a lot like getting on-the-job training from a competent co-worker. You are given everything you need to build a simple application. (If you want to understand how you built it, or how to build something a little different, you will have to do some further study.) This seems fine to me, this is an excellent springboard to Angular/ASP.NET development. Once the user has followed this course, they are adequately prepared to begin the learning journey. As a further benefit, this video makes use of Visual Studio Code, an excellent free IDE. The instructor provides plenty of nice usage tips, these are valuable on their own. 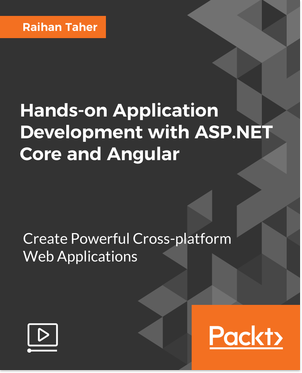 If you're looking to get started with Angular on ASP.NET, I would recommend this video.